This review first appeared in the July 18-19, 1998 issue of the American Reporter. In his last years, Humphrey Bogart confided to friends that he was worried that perhaps he hadn't accomplished all that he should have. That, in the grand scheme of things, perhaps being an actor wasn't really all that important. A major biography of Bogart (now out in softcover) certainly dispels the notion that Bogart's body of work doesn't matter: "Bogart," by Eric Lax and the late A.M. Sperber, is the type of serious study reserved for those whose import is unquestioned. Writers and thinkers such as Gertrude Stein, Igor Stravinsky and Pablo Picasso (to limit ourselves to this century) are the typical subjects of thorough, exhaustive and deeply researched bios. So too  now  is Bogart. "Bogart" is a traditional, chronological biography, tracing the actor's life from his birth on Christmas Day 1899 in New York to his death 58 years later from cancer. The bulk of the book is focused, as it should be, on the latter part of his film career, starting with "The Maltese Falcon," which propelled him from supporting roles and B movies to international stardom  making still-classic films such as "Casablanca," "To Have and Have Not," "The African Queen," "Sabrina," "Treasure of the Sierra Madre" and "The Caine Mutiny." It is this section which is the heart of the book. Sperber and Lax (who took Sperber's notes and research and finished her draft) do a wonderful job of weaving others' recollections of Bogie, as well as quoting from interviews he gave during his lifetime, into the narrative so that we gain a sense of how Bogart himself viewed his craft during his most productive years. What comes through is a picture of a man who was a late bloomer, or at least who continued to grow professionally throughout his life. Bogart was already past 40 when director John Huston cast him as detective Sam Spade in "The Maltese Falcon." Until then, his career had been spent as a bench player for Warner Brothers. He'd made dozens of films since coming to Hollywood to stay in 1932 (earlier visits had proven unsuccessful), but few were memorable. He was typecast as a heavy in his early films, after years on Broadway being typecast as a pretty boy. And all this had followed his going into acting out of a lack of any real goals in life. But an intense drive slowly blossomed in Bogart, and if his career didn't take off in his 30s, then his ambition certainly did. When he got his chance to handle meatier roles, first in the overlooked "High Sierra" and then in the popular "Maltese Falcon," Bogart was ready  and he took full advantage of those opportunities. Second only to the success of "The Maltese Falcon" in shaping the mystique of Bogart was his romance and marriage to Lauren Bacall. And "Bogart" devotes quite a bit of space, again appropriately, to the relationship between Bogart and Betty Bacal (who had just been given her stage name of Lauren Bacall). The unknown Bacall was cast opposite Bogart (then married to his third wife, Mayo Methot) in the film version of Hemingway's "To Have and Have Not" in 1944. He was 45; she 19. As told by Sperber and Lax, despite the publicity and public image of a red-hot and wild romance, while Bogart and Bacall did fall deeply in love, Betty brought more stability to his life than any of his previous wives. He would have his only children with her, Stephen and Leslie. And in Bacall, Bogart had finally met his match  in intellect, temper and willpower. Betty brooked no nonsense, and their marriage seems to have been a happy one until his death. "Bogart" also takes an unflinching look at the actor's role in the Red Scare of the 1940s and '50s. According to Sperber and Lax, after first taking a leadership role in Hollywood's resistance to the House Unamerican Activities Committee, Bogart eventually buckled under the pressure  when his livelihood was threatened, he caved and publicly denounced his earlier opposition to the hearings into Communists in Hollywood. For that, many in Hollywood viewed him as a traitor. 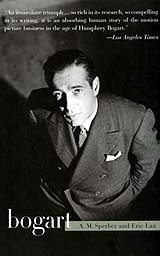 But the public soon embraced him again as one of its favorite actors, and Bogart lived out the last five years of his life as one of the country's most popular and highest-paid movie stars. As mentioned, this biography is wonderfully researched and all of the quotes and references are carefully cited. It is also written in a clean, brisk style that makes for easy reading. Unfortunately, the authors of "Bogart" engage in a bit of the psychological analysis that passes for biography these days. In particular, Bogart's relationship to his mother, Maud Humphrey, is set up as some kind of defining tension that shaped all his future relationship with women. Which may or may not be true, but it certainly seems a bit beyond the scope of a historical work  and readers may well question whether the authors have the requisite expertise to engage in such analysis. But any book with that as its only major fault is in pretty good shape.